Fight the flu season with Fit for School! A new survey commissioned by ProVen Probiotics has highlighted the effect of children’s coughs and colds on school attendance and has shown that GP’s still commonly prescribe antibiotics to children with colds. The recent 2015 nationwide survey of 1,000 parents of primary school age children has revealed that two thirds of children take days off school every year, due to the common cold, and that more than 50% of those who went to the doctor with cough and cold symptoms were prescribed antibiotics. 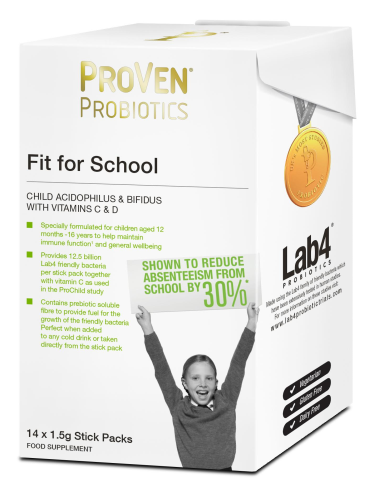 ProVen Probiotics’ Fit for School has been proven to halve the days of illness and time off school, due to coughs and colds in children of school age, as it bolsters up immunity. The new Fit for School stick packs provide 12.5 billion Lab4 friendly bacteria per stick, along with vitamins C and D to contribute to the normal function of the immune system. Getting to grips with the most common illness in the UK…. Coughs and colds! •The common cold is a viral infection of the upper respiratory tract, which mainly affects the nose. •Signs and symptoms include coughing, sneezing, runny nose, sore throat and fever. •Adults suffer an average of 2-3 episodes per year and children around 8. •Colds are most common in autumn and winter and peak between November and March, which can relate to school term times when children are crowded together and are likely to have low immunity and poor hygiene. •The infections are then brought home to other members of the family. •The cold weather also prompts people to spend more time indoors and increase the chances that viruses will spread from one person to another. •Insufficient sleep, lack of exercise (which also might be more difficult in the winter months) and poor nutrition have also been linked to a higher risk of colds, due to their potential effect on immune function. A month’s supply of Fit for School stick packs is £14.95 and available from http://www.provenprobiotics.co.uk and independent health food stores.